Krishna Devi with 966 marks out of 1460 topped the RAS 2007 exam. Many Congratulations to her and all those who secure good Ranks. RAS 2007 Cutoff : RPSC not come out with the cutoff as of now and I don't think there would be any cut off as such because it will only give the merit positions and on the basis of which services will be allotted so one can only have an idea with their merit number. Can anyone have any idea about the Cut off marks of RAS 2007 examination? @ 803 Male Gen : I afraid the chances are grim for you. Dear Naresh what about OBC Male @ 810. @ Varoon : you can get subordinate services with this score. @ above : state services and maybe she get accounts but as I said earlier it depends on her overall merit and other factors so plz wait for DoP to come out with the final list. see it depends on this factor also like if more women above you prefer accounts then you may get ACTO therefore not much information is available to us we can't say something concrete about that. what about 810 markes in GE WE is thair chance ? maybe but not sure abt that ! you may have chances to get some service. hey when will that cut off come for RAS 2007 ? Only after DoP send letter for medical and it takes a month or so ! Hi naresh I got 805 marks in ras-2007 exam. I belong to OBC MALE. CAN I GET ANY POST? may get cooperatives but looks little difficult ! Thank you naresh.you know that I had appeared in RAS-2007 mains exam by the decesion of heigh court and Ifound only 1.5 month for preperation.so I SCOR 805.but I am DETERMIND be toIAS.Iam going to be appear in 2010 pre so Iwant your kind help.my med.is hindi andmy sub.are pol.science[pre]and philosophy.Iam net slet recently 3rd grade teacher.iam releted to very poor and rural area. will try to help as much as possible. what about 813 markes in GE WE is thair chance ? what is your expected cut off for GE WE ? 810 is what I assumes to be cutoff for OBC/GEN; GEN and GEN/WE. hi naresh i am st we,score is 708.is there any seat for me? ST/WE I think you can get a seat. with 784 marks in SC category? 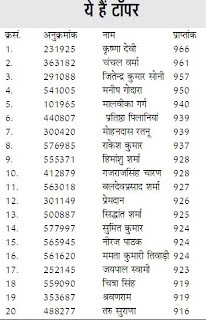 check out the number of vacancies for SC and your rank, this way you can easily calculate it. hi!Naresh as i hv told u yesterday.i m st/we i hv got 50 rank and 708 marks in st we,is thr any chance 4 me? @ above : If your rank is 50th amongST/WE then it seems little difficult as there is only 30 seats for ST/WE but if its 50th in ST then you have chances to get a service. well there has been many ifs and buts and the final words are surely of DoP, we can only assume on the facts available to us. 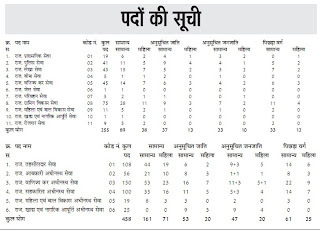 Although not many candidates from ST are taking general seats but yes some ST are already in services and they may not have opted for some services so there is always chances. Good Luck. NARESH I GOT 59th RANK N 890 MARKS.I BELONG TO GEN.WE. MY PRIORITIES ARE RAS>ACCOUNT>RURAL SER. WHICH SER.SHALL I GET? It would be better to wait for official announcement ! @ Prabhu Dayal : It seems you can get Cooperative services. @ above : I don't think so ! hi Naresh ji!Do you wn the whole process of RAS-2007 will b going to start? @ Above : RAS 2007 process is going to end :)soon after allocation of services soon by DoP. hi naresh will these rg people be categorised separately? @ above : No but they would be considered against NGE (Non Gazz. Employee)if they are otherwise eligible in that category. RG although have benefits in case of Age relaxations. this year a sc woman topped sc category will she counted as sc general and take a male seat? or she will be taking only sc women seat? @ Above : She will take SC Male seat if its vacant at her merit position! but there is horizontal resrvation, so i think she will take sc female seat.. there are 4 proper ras seat for sc general and i seat for sc female... so i think she will take that one female seat of proper ras . wat u say naresh? 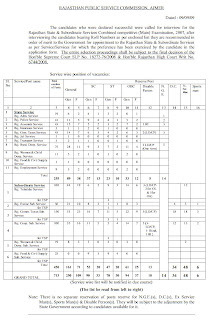 hi naresh, my overall rank in sc category is 52.. there are 50 seats reserved in state services for sc category.. there are 24 sc rg people and 11 sc women ahead of me, if i dont count these rg ppl and women my rank in sc category comes to 19.. wat u say wat service i can get? when is new vacancies for RAS coming? I happened to see the circular dt. 7th sept 2007 of DoP,Raj.related to women's reservation.It has superceded circular dt.20 may 2000.It is interpreting the word-'horizontal'differently.Plz clarify if women in eg. gen category will take the seat of men gen category or not? What change has been done by this circular? @ Shikha : If you have seen the circular then you are in better position to interpret it. As far as the process goes till the last RAS, the Gen Women if placed higher can take the Gen male seat. Thanks Naresh,well I just wanted to know if women are at a disadvantage now? Is horizontal reservation an additional reservation or afixe percentage now ? No reserved category is at disadvantage as there is no fixed quota for any category, a roster is applied at last stage otherwise there will be no sense of reservation as such. @ Shikha : first of all congrats for getting a good position secondly the clouds of doubt arises due to lack of official clarifications. We are living in such a highly evolved technology but its irony that there is no one to whom one can contact otherwise in this networked world it will only be a click away and many people can plan accordingly as these are important days for everyone there who appears in competition exam so if one gets the clearer situation one can plan accordingly, anyway hope the new breed of officers can somewhat change the system. Good Luck. Thanks for your wishes Naresh.Well I completely agree with you that we lack a prompt information network as far as competitive exams are concerned.One has to go through a gruelling process right from deciding to appear in these exams. Anyways hope you have better luck and success next time ! thanks for wishes but I already decided to go with banking job and will make a career in banking only. Fine deciding on sth and sticking to it is good.Well I appreciate your efforts at maintaining a website that is a mountain of information and more importantly a source of solace to many. List of selected candidates would be out only after medical which will take around two more months and th whole process may take more time but DoP is said to be preparing the listso one can have rough idea about the cutoff. Yes, there are good chances that you get some service. hi !i have scored 811 marks GE WE. ANY CHANCE TO GET SERVICE? hi naresh i have scored 811 marks GE WE.ARE THERE ANY CHANCES FOR JOB? hi sir, my name is Brij Kishor Pandey ,catagory- GE.I scored 818 marks in RAS-2007. Can I get selection? How i can get list of selected students or those who are called for medical? hi! i have scored 811 marks in ras 2007 GE WE. do i have any chance to get service? Hi Naresh, can you please provide the citation/case name of Supreme Court on the validity of 'Scaling Procedure' in RAS and other state sevices exam ? Naresh..i have joined the community for a long time...but not started well yet. what i have seen is that u have been helpful to all members..as u have decided ur career in banking, i heartly wishes u best of luck, and also want u to keep helping others as ur time time with the same desire to get good officers in the system. wht abt d 1st round of the medical, all appeared or not..?? whn z 2nd one gonna take place..?? nybdy has got any idea..?? pls naresh ji,main khemaram ras 2007 sc boy, mera total marks 765, medical ho cuka hai, muja konsi post milegi. hi naresh well done keep it up.your replies provide much succour to many candidates,i have also one query when the selected candidates will be called for the training. Dear Naresh, what about OBC Male @ 833 in RAS2007.please tell me any chance to get service and which service/post may be possible. merit for obc male is closed on 821.and there is no provision for waiting list in ras as per my knowledge these posts are going to be added to the next vacancy.result of ras2008 may be declared in june. @ Sumer : I think you may get the management paper at Tonk Phatak area od Jaipur but not sure abt electronics and comm. paper as these are unconventional paper and only a few opt these optionals. This is Nilesh Here, I did my B.E and M.tech in mechanical engineering. currently working in a IT company. can you please let me know when the next RAS is sheduled. also please let me know how to proceed for preparation. I am thinkin as maths and psychology as optional, with maths in prelim. Please suggest. this is surendra, i have done my engineering in electronics and communication and looking for RAS. I want to know the best subjects according to my profile. i am thinking about Public administration but not decided about second one. plz Suggest. hello ,I want to know that what are the strength and weaknesses of psychology as a subject in RAS pre ?Is this a scoring subject?what about scaling in this subject?Getting how much marks in psychology can assure one for RAS pre. I am a Computer professorial in a MNC and based at Mumbai. Want to prepare for RAS exam. have following quires in my mind. 1: Is there a chance that RAS will be conducted next yr.
2: Any good postal course. 3: Want to opt comp engg. so from where i can get the material and last yr papers. 4: What is cutt off for a GEN male candidate for RAS and RPS services. 5: Any change in RAS structure. and could u please tell me how much marks should i aim at if i have to get a proper ras seat..
i am bsc nursing 4th year student. can i fite ras exam . and what's about sub selectin ?? and how many sub whiches i choose?